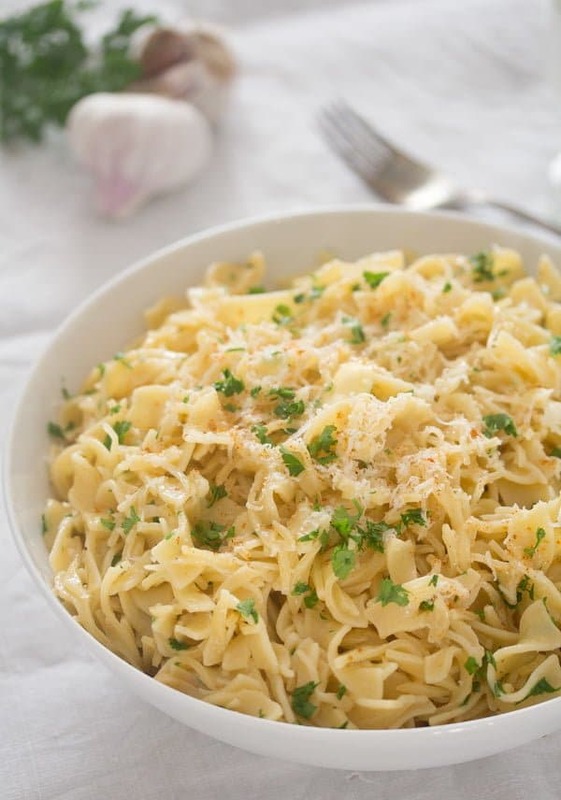 Incredibly easy to make, aromatic buttered noodles with garlic and Parmesan. So, butter noodles was not something I have ever eaten or even consider making not long ago. I don’t know why it had never occurred to me that you could make such a simple dish, I mean, rice with butter are quite a regular children meal, so why not butter pasta? 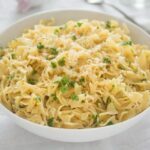 And the garlic and butter pasta became an instant classic in our house, both kids devoured the noodles and they keep asking me to cook them again regularly. 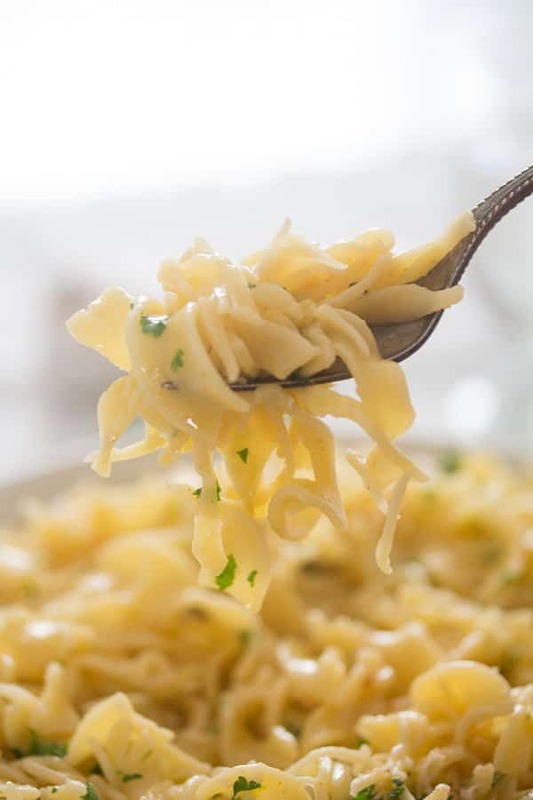 These buttered noodles with garlic are a simple pasta dish using basic and cheap ingredients. Otherwise, what you need is good quality butter, lots of garlic and some Parmesan. You can use either salted or unsalted butter. If you use salted butter, adjust the taste accordingly at the end of the cooking process. 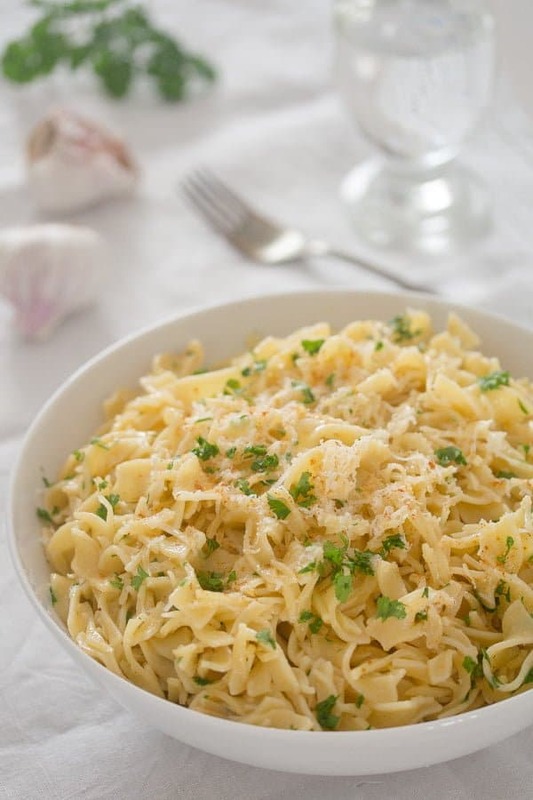 I always recommend using freshly grated Parmesan, I cannot stand the already grated sort, which is full of preservatives and tastes nothing like real Parmesan. If you want to make this garlic butter sauce for pasta vegetarian, choose a vegetarian hard cheese instead. Press or grate the garlic cloves. Slowly melt the butter in a smaller saucepan, stir often and give it about 3 minutes. Add the grated garlic cloves and stir for about 2 minutes until they are golden. It is very important to stand by the pan during this time and keep stirring, the garlic should only get golden and not too brown. If it gets too much color, it will get rather bitter. Add the salt, pepper and some chili flakes to taste, the garlic butter sauce for pasta should get slightly frothy by now. Remove from the heat. Drain the noodles, give them back to the pot and mix them with the garlic butter sauce immediately. Add the freshly grated Parmesan, sprinkle with some parsley (if desired) and serve immediately with a green salad. Don’t be tempted to add the Parmesan directly to the butter sauce. I did that once and all the cheese clumped into a ball. I had to throw it all away and start again… Annoying! Bring a large pot of water to a boil. Add salt and the pasta. Cook according to the packet's instructions. While the pasta cooks make the garlic butter sauce. Give the cubed butter to a small saucepan. Melt slowly, stirring often. Let it simmer for about 3 minutes. Grate the garlic. Give the garlic to the butter and let cook for about 2 minutes while stirring very often. The garlic should get golden. Keep an eye on it, it should not get too dark. Add the salt. 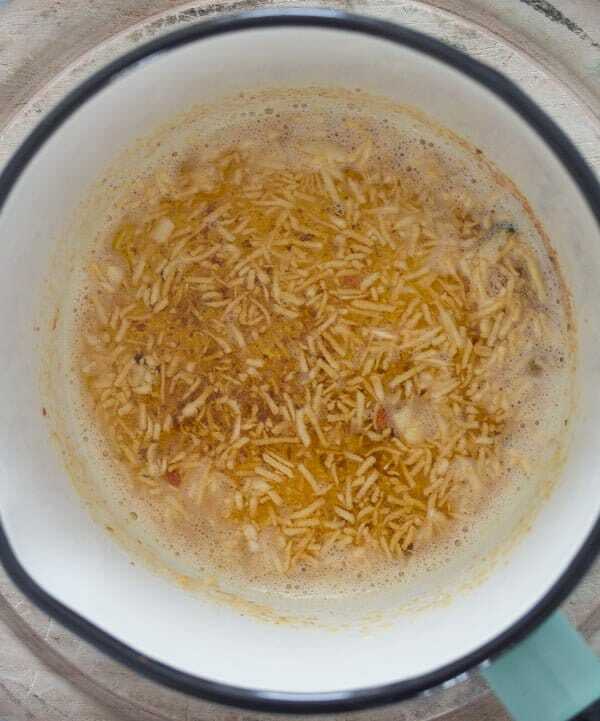 Start with 1 teaspoon and add more after mixing the noodles with the butter sauce. You will probably need some more if you used unsalted butter. Add pepper and some chili flakes to taste. Stir well, the butter should start to get a little frothy and rather brown by now. Remove from the heat. Drain the noodles and mix them immediately with the garlic butter sauce. 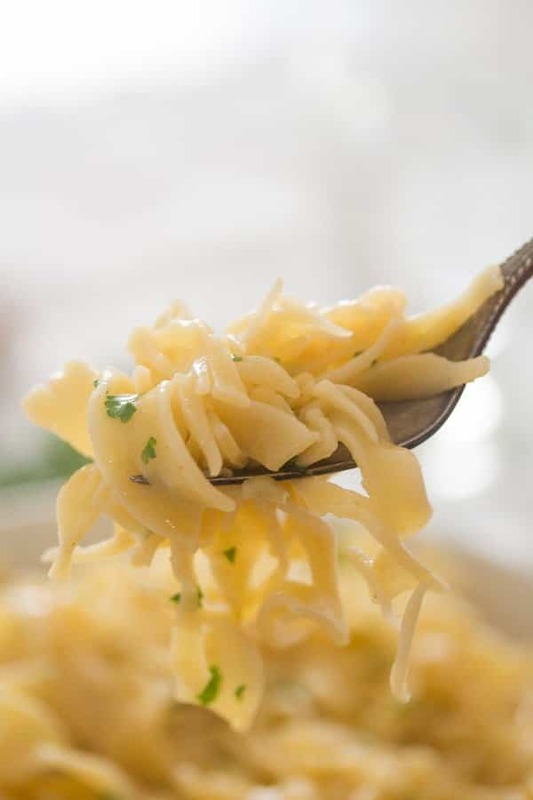 Give the grated Parmesan to the noodles as well. Adjust the taste with more salt and pepper, if necessary. Sprinkle with some chopped parsley, if desired, and serve immediately with a green salad. Note: Either salted or unsalted butter, adjust the salt amount you use for the garlic butter sauce accordingly. 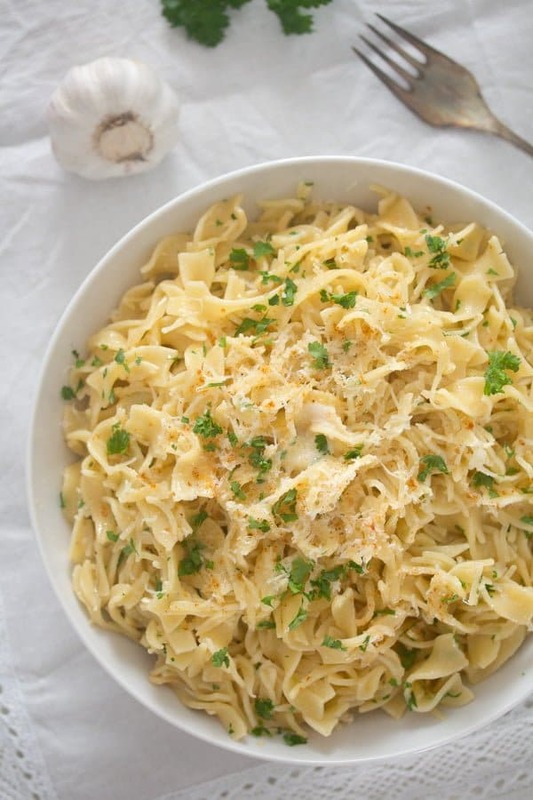 Garlic, butter and Parm….the noodle has got to be GOOD! Oh my, this is so delicious and simple to make!!! I love that your kids love it Adina. I can almost smell the delicious garlic butter now…. Good tip wo wait on adding the cheese to the butter, it would be just my luck to do that. Have a great week! Happy New Year, Adina! 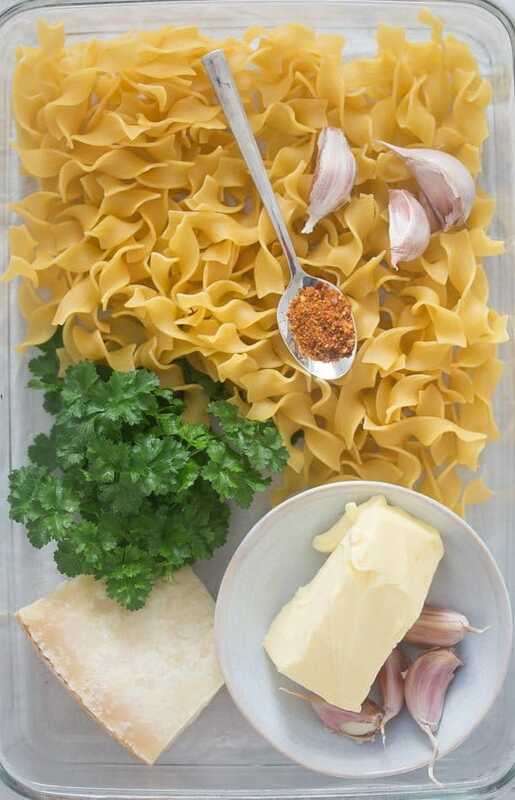 Thank you for reminding me how much I love simple Italian pasta dishes…. 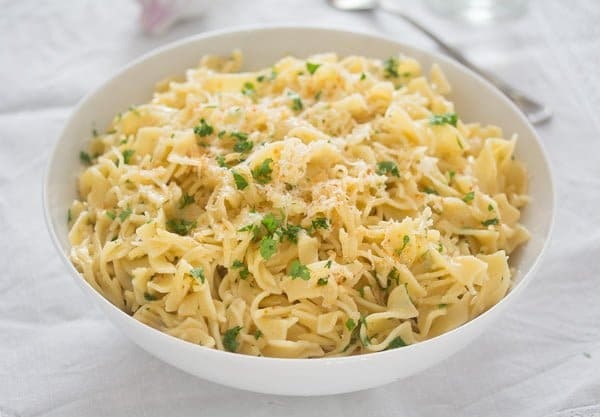 This delicious-looking butter pasta reminds me of many of them. Sometimes the simplest of dishes like this are forgotten about. I like to serve these noodles as a side with chicken marsala. You’re killing me tonight Adina! 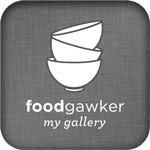 I’ve missed so many good recipes and this one has me hungry all over again. Simple pasta dish with lots and lots of flavor – the best kind! I followed the directions with exact measurements and it was to dry for my taste. I added some chicken stock and heavy cream. This came out creamier. Next time I will try half and half to make it a little lighter.